Hurricane swept through the island without mercy. Early that morning, a 15 foot surge of water driven by 135 mph wind came through. Many people never thought that would wipe out 8000 people and destroy 3600 homes and businesses before the day was over. There was very little warning of the storm. High tides came ashore and flooded some streets but that was usual for a city 8.7 feet above sea level. The tides got stronger as the day progressed but the blue skies convinced the residents of another storm about to pass by. By mid morning, rain clouds started developing and the wind started picking up. By afternoon, it was totally a different story. A category four hurricane hit the city with a destructive force that could not be forgotten. The rage and fury of the Galveston hurricane persisted into the night. The morning after the storm revealed the magnitude of damage done to life and property. Over 1500 acres of land was under water and about 8000 lives were lost. Take a look at more images after the disaster. After the rampage, the city of Galveston started making efforts to clear the damage and rebuild. One of the dramatic efforts the city made to prevent future storms of that magnitude was to raise the city 17 feet above sea level. 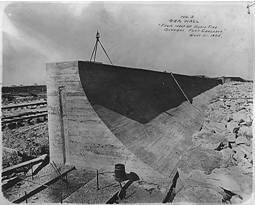 The second effort was to build a three mile seawall along the coast. Over 2100 buildings were raised to 17 feet in that effort. The Galveston Seawall serves as a great reminder of the September 8, 1900 hurricane. 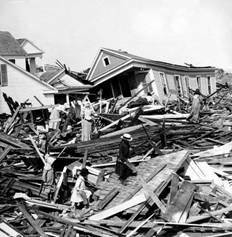 Some other hurricanes passed through the Galveston county but the city persevered and recuperated from the disasters. Today Galveston is again a booming tourist city. People travel to Galveston to see 18 century Victorian homes that survived the Galveston hurricane of 1900 and to stay in some of them like the Tremont House, built in 1839. The seawall is busy with Galveston hotels, condos and restaurants. Vacationers go on cruises and the Strand shopping center is active. The museums and Moody Gardens Galveston are exceptional tourist places. The 1900 Galveston Hurricane can be remembered for what it did but the city can now remember the good things happening.